BEIJING - Fruit wholesaler Hao Hongfu will wait until next year to buy a car from a General Motors Co venture in China, even though he could get a 1,545 yuan ($232) tax break for buying another vehicle now. The upcoming Baojun 630 sedan from SAIC-GM-Wuling Automotive Co should be more reliable than a Chinese brand, Hao said. He wants another car to complement the Beiqi Foton Motor Co pickup truck he uses to haul apples, pears and oranges in Shandong province. "It is a pity to give it up," Hao said of the consumption-tax rebate. "But the Baojun looks very nice. I want to try out a foreign product." Overseas automakers including GM, Ford Motor Co and Nissan Motor Co should benefit next year if the Chinese government ends the rebate as expected by Dec 31, said Bill Russo, a Beijing-based senior adviser at Booz & Co. The subsidy, which cuts the tax from 10 percent of the purchase price to 7.5 percent, applies only to cars with engines of 1.6 liters or smaller, a segment of the market dominated by Chinese models. Local brands accounted for more than 63 percent of the new models with that size engine last year, according to the China Association of Automobile Manufacturers. "The game that has been played with incentives is to try to keep consumers, especially first-time consumers, interested in purchasing those locally branded cars," Russo said. "To phase out the subsidies is more challenging for local companies than for foreign ones." Rising incomes also should prompt car shoppers to buy more foreign models in the world's largest auto market, Russo said. China's per capita income of $3,744 last year was more than double the 2005 amount, according to the World Bank. Total vehicle sales may reach a record 20 million next year, Russo said, an 11 percent increase from the manufacturers association projection of 18 million this year. Total sales are up 34 percent through November over a year earlier, and passenger-car sales rose 35 percent in the same period. The government hasn't said whether it will extend the rebate into next year. It was continued this year at the request of Chinese manufacturers, said Xiong Chuanlin, the association's assistant secretary-general. "I doubt the tax cuts will continue," Xiong said last week in Beijing. "We don't think it's appropriate." The government aims for local automakers, including Geely Holding Group Co and BYD Co, to account for more than 40 percent of the market for cars, multipurpose vehicles and sport-utility vehicles, according to a stimulus strategy released in March 2009. They now make up 31 percent, said Gerwin Ho, a Hong Kong-based analyst for Citigroup Inc.
"You have some policy withdrawal and that's going to slow down car sales," Ho said of the overall market. BYD, which is backed by Warren Buffett, has sold the most cars among domestic automakers this year, according to association figures. Its F3 sedan, China's best-selling vehicle, comes with a 1 liter or 1.5 liter engine and is priced from 59,800 yuan. "The tax-cut incentives definitely played a part in its popularity," Tong Wei, a BYD salesman in Shanghai, said of the F3. "Its sales are likely to dip next year when the subsidies are removed." BYD spokesman Paul Lin didn't respond to e-mails or calls seeking comment. The company's stock is down 39 percent in Hong Kong this year, compared with a 3.4 percent increase in the city's benchmark Hang Seng Index. GM, Ford and Nissan are among the foreign automakers introducing smaller cars and expanding into China's interior to compete with domestic companies. GM, the best-selling foreign automaker in China, said sales are up 33 percent through November over a year ago and may reach a record 2.3 million in 2010. The Baojun model is set to go on sale early next year through more than 100 dealers. GM, which raised $23.1 billion in an initial public offering last month, said the Baojun line is meant to be affordable. It didn't announce the price. Sales growth the past two years has been "extraordinary" and should be 10-15 percent next year, GM China President Kevin Wale said. 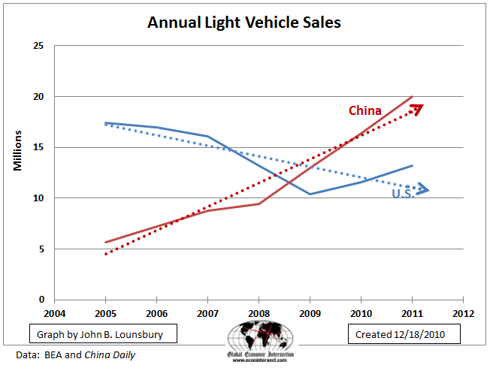 In 2009, China's auto sales surpassed those of the U.S., reaching 13 million units (cars and light trucks). 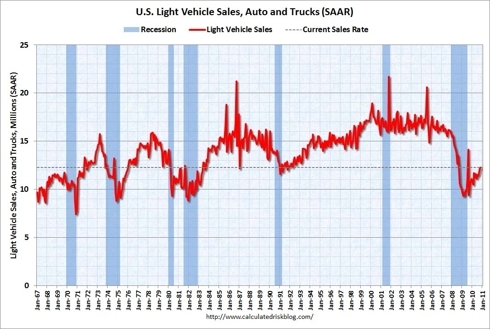 This came as The Great Recession drove U.S. auto sales to a level far below the record of 17.4 million sales in 2005. By 2009 U.S. sales had plummeted to 10.4 million for the year. Through November 2010, China's auto sales reached 16.4 million, putting that country on track to equal or exceed the U.S. 2005 record. The forecast for 2011 is for sales to reach 20 million which would dwarf the U.S. record. Meanwhile, the U.S. auto market seems to be headed for 2010 sales between 11 and 12 million, as seen in the following graph from Calculated Risk. 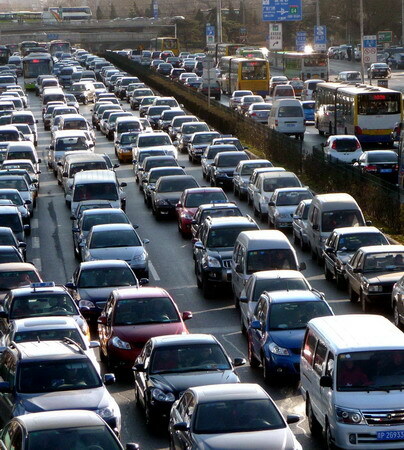 JD Powers has forecast U.S. light vehicle sales to be 11.6 million in 2010 and 13.2 million in 2011. Overseas automakers including GM, Ford Motor Co and Nissan Motor Co should benefit next year if the Chinese government ends a rebate that favors domestic manufacturers as expected by Dec 31, said Bill Russo, a Beijing-based senior adviser at Booz & Co. It looks like China will move into position as the largest consumer of automobiles in history and is likely to remain there. As shown in the following graph, it could be said that China and the U.S. are driving in different directions. However, it is to be expected that U.S. auto sales should continue to improve so that the down sloping blue arrow may well be temporary. It is not reasonable to expect that the U.S. growth rate will soon (if ever) reach that of China. Simply based on population ratios it might be expected that China could eventually have around 3 - 4 times the auto sales of the U.S.